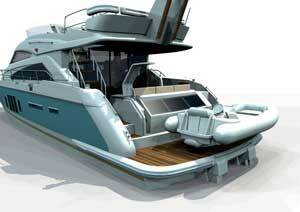 TweetFairline have released initial renderings of the new Squadron 50 and 58 which will both be launched next year. The new Squadron 50 borrows design cues from the Squadron 65 as well the latest Targa range of sportscruisers where as the 58 is a development of the popular Squadron 55. 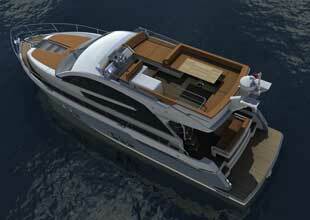 On the new 50, as we have come to expect, glass is key in the design of the boat with large areas of glazing in the saloon and the signature strip of glass on the foredeck which transforms the master cabin. 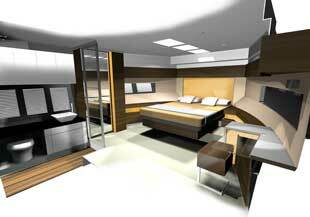 Amidships there are two identical guest cabins with two single berths each but guests do share a single bathroom which also acts as the day heads. 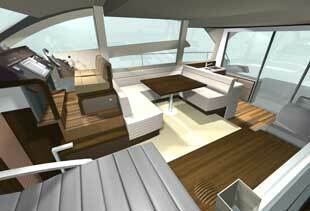 In the saloon, Fairline have opted for a galley aft layout, putting it in a prime position to serve both the cockpit and the flybridge. To port there is a small sofa, entertainment unit and a chaise longue beneath the windscreen, adjacent to the lower helm. Fairline claim that the flybridge is the largest in its class and benefits from a substantial wetbar, a sunpad forward and swathes of U-shaped seating aft. There are three engine options available, two from Volvo Penta with either 575hp or 670hp or the Caterpillar C12 with 710hp which, along with the largest Volvo units should mean a top speed of 31 knots. 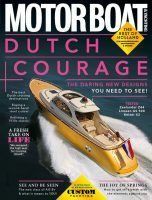 The new Squadron 58 (below) gains a larger cockpit over the old 55 but keeps the winning features like the tender launch system and overhead lift-up transom shower. When the 58 is launched next year it will start from £885,000 ex VAT but prices for the Squadron 50 are yet to be announced.